IBM BladeCenter® technology for every mission environment. The Tracewell Rugged Blade System (RBS) is the first and only ruggedized, mil-spec blade solution based on IBM technology. 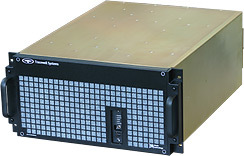 The RBS is an ideal choice for demanding Department of Defense, military and aerospace applications that need the advanced data processing capabilities of IBM BladeCenter in a small or rugged form factor engineered to operate in a wide variety of mission environments. Designed to meet the size, weight and power requirements of air, land and sea deployments, the RBS provides the highest performance-to-size ratio with the reliability today’s missions and programs demand. RBS systems have been successfully performing on mission since 2009, providing a powerful compute platform for data intensive applications, such as radar, signal intelligence, data mining & analytics, and cloud computing. The RBS product family provides the cost and performance benefits of commercial technologies, and can easily integrate specialty blades, storage options and high-speed system networking technologies as they become available from IBM and other leading technology providers. Tracewell has created a high speed switch module, the HSSXpress, to maximize I/O performance. Available in 3 levels of ruggedization, RBS units come in both 3 and 5 slot configurations with standard and high-speed switching options. environments that require EMI shielding and air filtration. Ideal for ground vehicles and airborne environments. Download these datasheets for more information.